Our trash and recycling cans have always been along the side of our house since before we moved in. One day I was talking to my neighbor about random HOA rules and he mentioned that you weren’t supposed to have your cans in view of the street. At the time, I figured oh well, since they had always been there, but I also decided that eventually I would fix it. I can’t move them, because our garage is always an active project zone and we have our shed in the small space behind the garage. 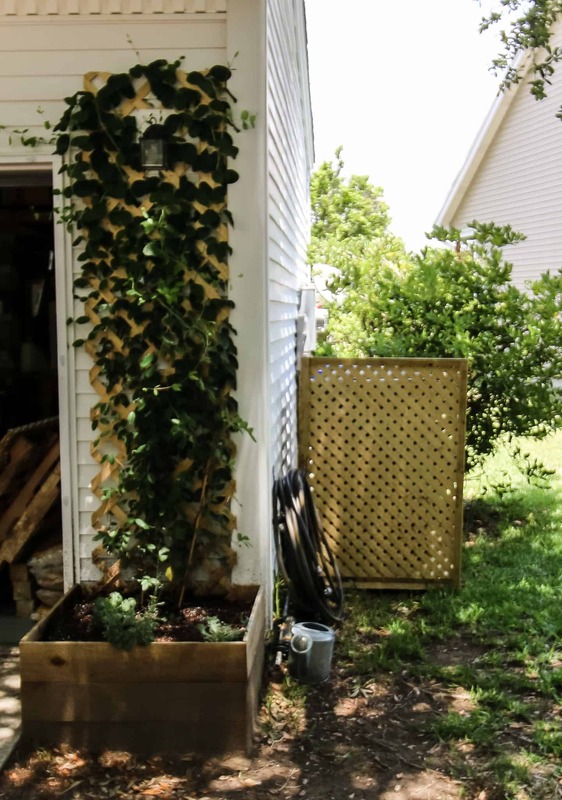 But, when I saw some roadside wood scraps one day, I knew I could make a free simple way to hide our trash cans. 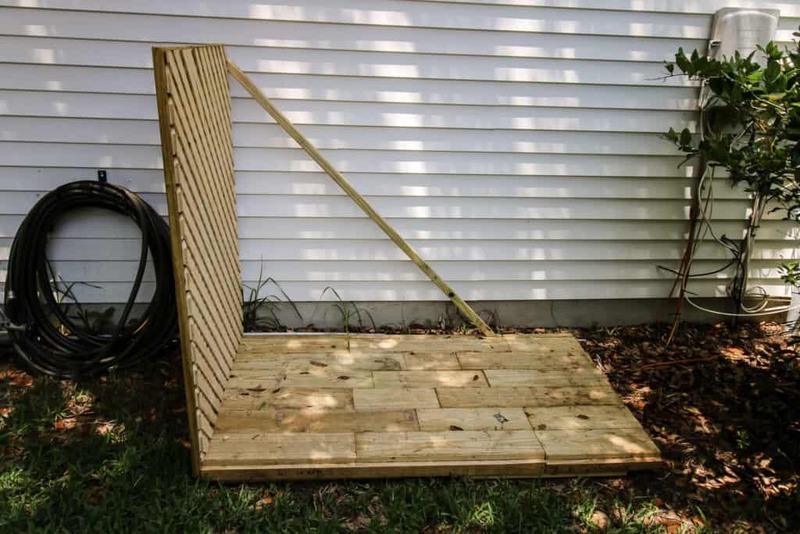 This is also a great solution if you are looking for outdoor garbage can storage! 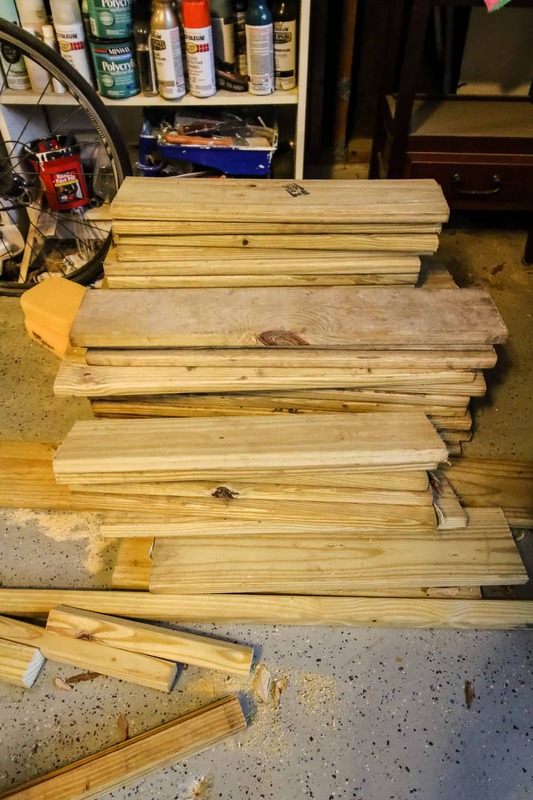 So my scraps were free, but they were 2-3 foot long scraps of fence posts that someone tossed in a pile when they finished their new fence. 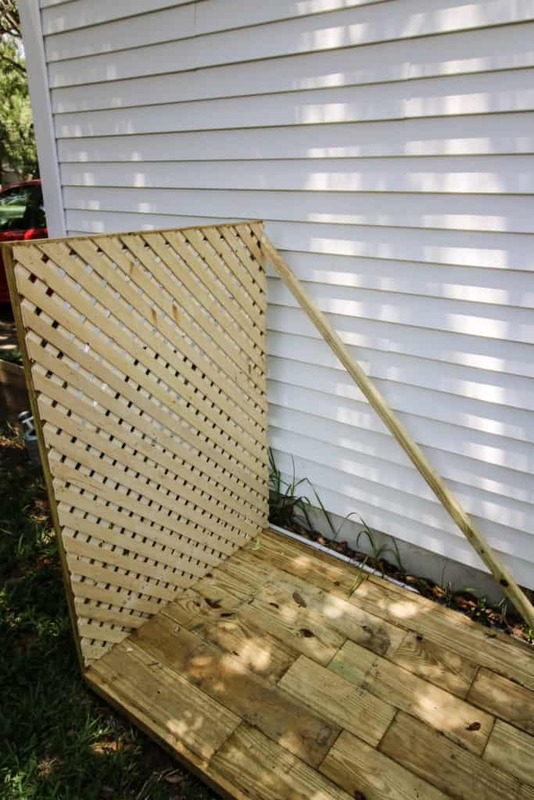 I basically wanted to make a platform encolsure for the two cans to rest on and attach a lattice wall to it. I couldn’t just dig down into the ground and build the wall because I know a bunch of wires and our main water line run right through that area. 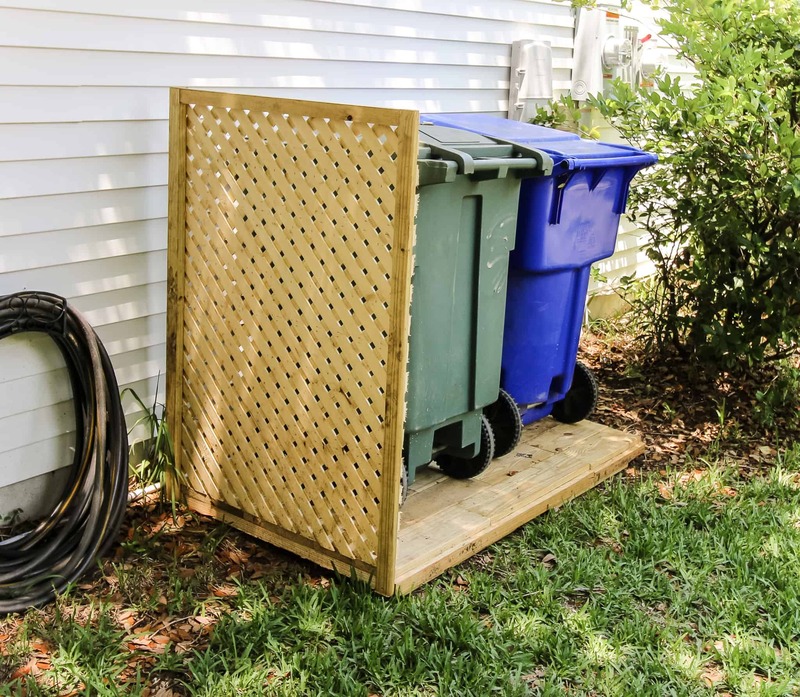 The most important thing to remember if you do this for yourself is to make sure the base is wide enough for the TOPS of both of your trash cans and is tall enough to go a few inches above the lid. So I started by building the base. I created a frame with support beams first. Then I cut boards to fit on the beams. Each board rested on at least two beams. 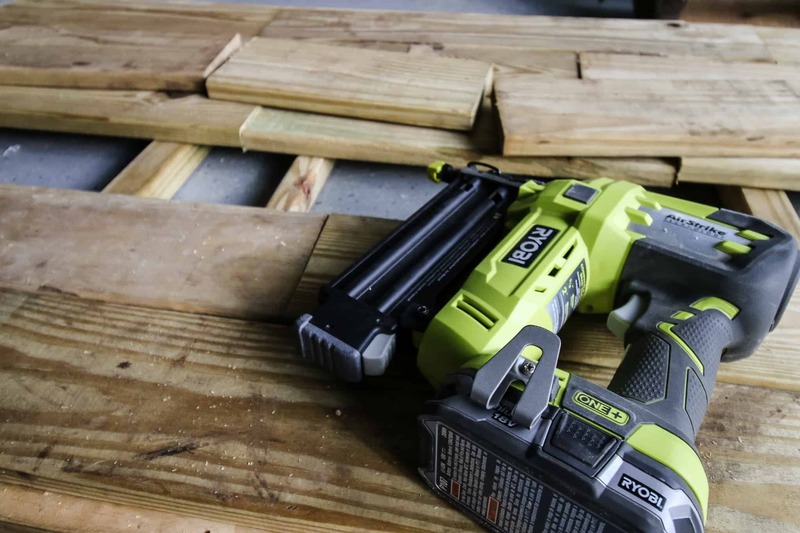 I used my RYOBI AirStrike nail gun to nail them in place. Then I built the wall. 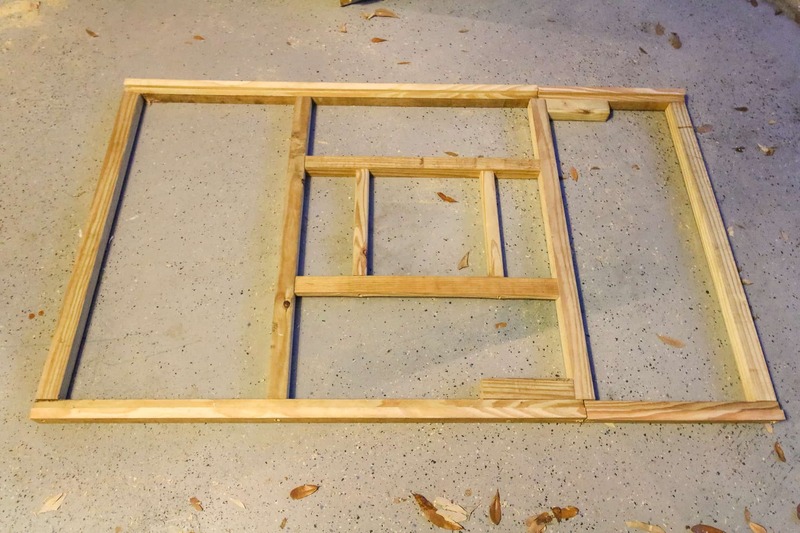 I cut the longest board I had taken into through strips about two inches wide. 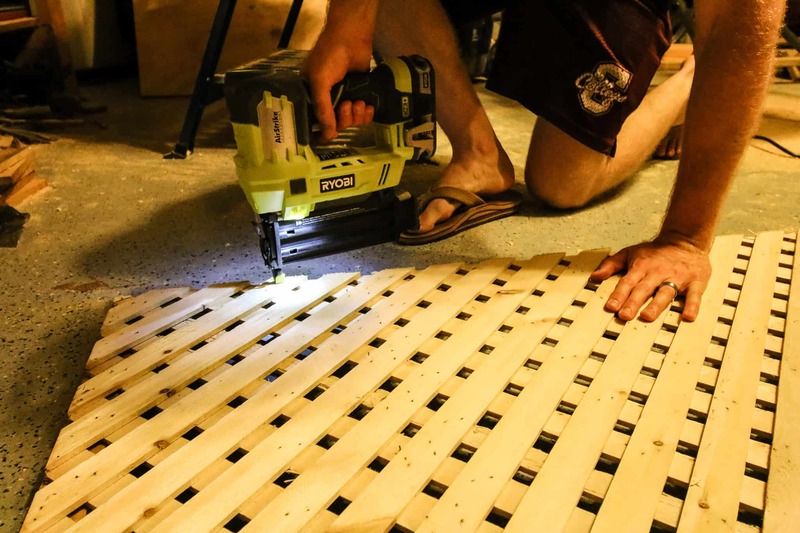 Then I cut a piece of lattice (this was the only thing I bought for this project) to be the size I needed. For me, it was 3 feet wide by 4 feet tall. Then I nailed this to the boards I’d just cut. Finally, I attached this to the outside of the base with screws along the bottom and one stabilizing cross-beam using a 2″x2″ I’ve had laying around. The wall needed to be stabilized from the top or it would eventually snap off if only connected by the screws at the bottom. I cut a 45 degree angle on each end of the beam and nailed it into place. In the end, it was exactly what I wanted! 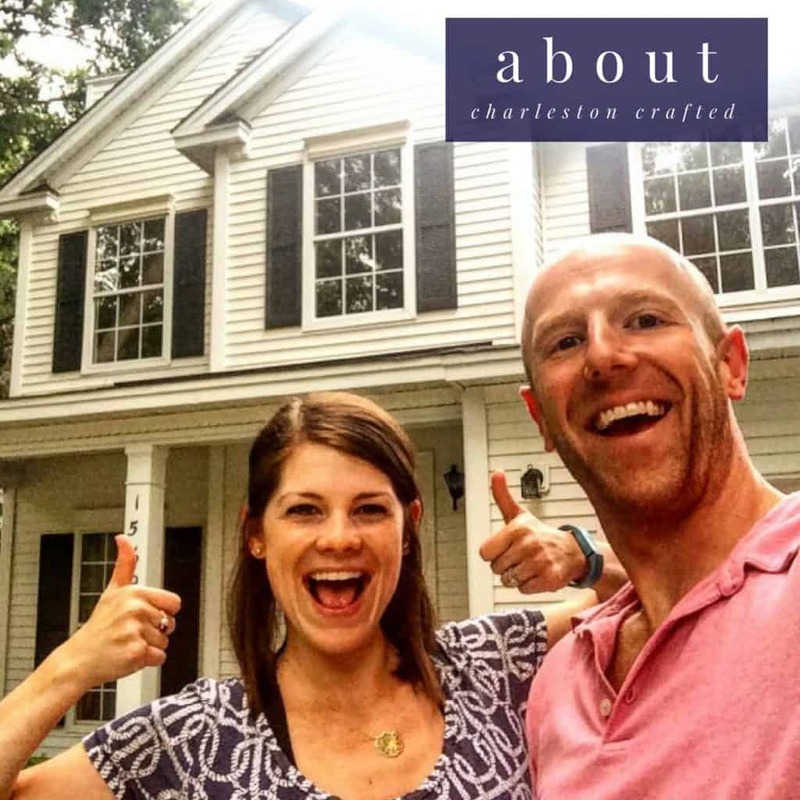 This project was great because it was almost entirely free. I was able to build the entire thing in about 3 hours. I was glad to get this project done this way even though it had been on my list for almost two years, but was never a priority. 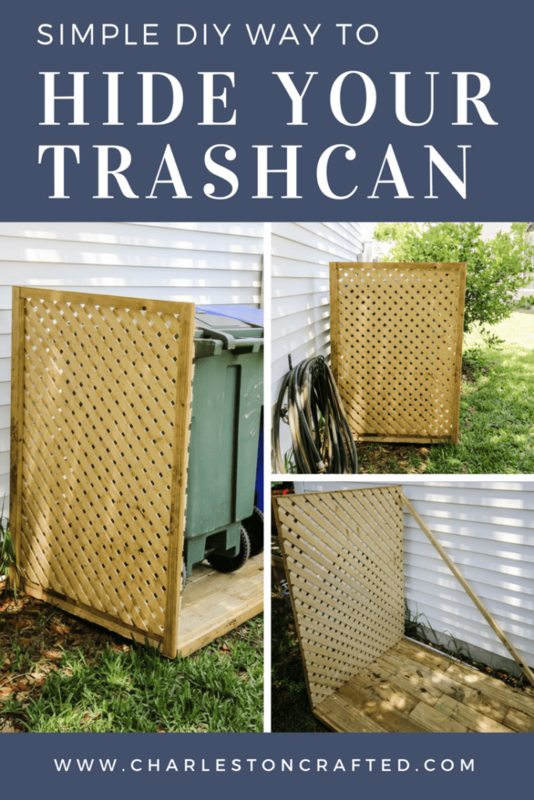 This is a simple DIY way to hide your trash cans and can be customized easily for your space! If you want to hide your indoor trash, check out our DIY tilt out kitchen trash can and our laundry room trash can hack!